Ukraine has banned the use of the ruble for making deposits in the country, as well as the use of the Russian currency for granting loans, according to a report from the central bank. The provision was introduced in a resolution of the NBU board, No. 699 of November 3, which has been published on the central bank’s official Web site. "[This resolution] bans the carrying out of these operations in Russian rubles in the country’s mainland: attracting deposits under bank deposit agreements... [and] disbursements of credits (loans), including overdrafts," the resolution reads. The document also bans the adding of funds to deposit accounts held by Ukrainian financial institutions prior to the coming into force of the resolution, and bans the prolongation of existing loans made in Russian currency. The NBU also banned the "movement of Russian cash across the administrative border of the free economic zone of Crimea, except when it is carried by individuals in amounts not exceeding the equivalent of UAH 10,000, with an oral declaration being made to a customs official." As UNIAN reported earlier, the Russian currency is continuing to shed value, as traders expect another wave of sanctions against Russia for its recognition of the elections in Donbas, which were illegal under Ukrainian law, and which Ukraine and the Western countries say violated the Minsk Protocol peace deal, of which Russia is a signatory. Ukraine is reported to be preparing sectoral sanctions against Russia, with the sanctions expected to target certain Russian companies. As earlier reported, based on the results of an illegitimate referendum on the status of Crimea held on March 16, the self-proclaimed Crimean authorities announced the inclusion of Crimea in the Russian Federation, while the United States and the EU refused to recognize the results of the referendum and applied a series of sanctions against Russian officials and businessmen. 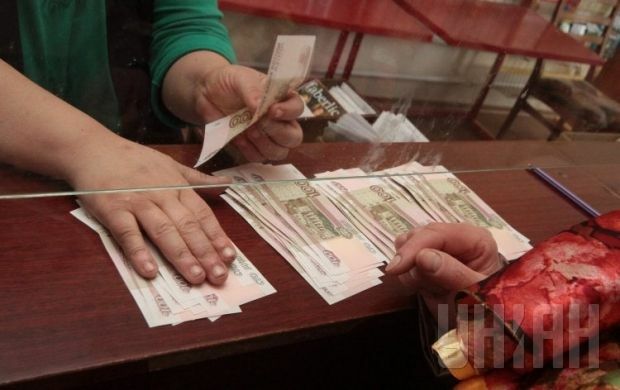 On May 7, the National Bank of Ukraine prohibited Ukrainian banks from carrying out activities in Crimea until the end of the Russian occupation, and from July 24 it introduced an emergency operation mode for the banking system in Donetsk and Luhansk regions, as well as in Crimea.